Dollar stores and discount retail corporations can target key demographics and establish projects within the residential market by using this free, printable business plan. COMPANY NAME is an existing grocery/convenience store and fueling station that is strategically located on scenic [ADDRESS] in [CITY], [STATE]. [ADDRESS]is the primary thoroughfare in [CITY], running north and south between two mountain ranges. The highway runs north to the [CITY] area before running into [STATE]. To the south, the highway runs to the [CITY]/[CITY]/[CITY] area. The Valley itself, which is 6-miles long by 12-miles wide, is populated by about 1,600 year round residents. Because of its lakes, rivers, and natural beauty, the highway was designated a scenic route by the United States government in 2000. For these reasons, the Valley hosts many seasonal tourists wishing to behold the scenic landscapes and make use of the outdoor activities available in the area. It also hosts many travelers migrating to and from the metropolitan areas mentioned above. The general population of year round residents in [CITY] include small business owners, irrigation-based farmers, and livestock ranchers. Typical household incomes in this area are near $55,800 with two-thirds of the population being 45 years old and younger. The store is centrally located among the only three communities in the northern part of [COUNTY] County, those communities being [NAMES]. The store boasts the only fueling station along a 52-mile span of the highway, with the nearest fuel competitors being located 20 miles to the east, 17 miles to the north, and 35 miles to the south. The store has been owned and operated by OWNER'S NAME since July 2005. His wife, [INSERT NAME], has been the general manager since they purchased the land, building and existing business. OWNER'S NAME operates the business as a sole proprietorship. 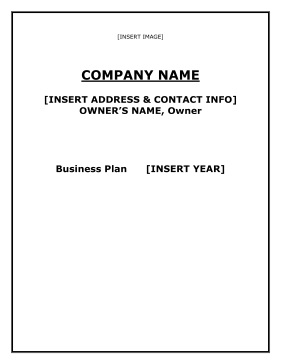 OWNER'S NAME and INSERT NAME make a perfect business partnership. INSERT NAME has twelve years prior experience as a supermarket head cashier, as well as eighteen years of experience in sales, bookkeeping and accounting. OWNER'S NAME had thirty years as a trucker in the fuel and food industry. The store offers on a year round basis a variety of staples, packaged foods, drinks (alcoholic and nonalcoholic), snack items, tobacco products, lottery, and select non-grocery items such as hunting and fishing items, as well as regular, mid-grade, premium, and diesel fuel. COMPANY NAME competitive edge is its location, its focus on excellent customer service, its commitment to the needs of the community, and the experience and knowledge of the owners. It is currently operating profitably and the business is well capitalized, but it lacks liquidity as nearly the entire equity of the business is in real estate and inventory. Its most serious threats are a prolonged economic downturn that continues to hinder area tourism and continued [STATE] fuel tax increases that may hinder the profitability of fuel sales. 1. To reinvent COMPANY NAME by expanding the building by 1,100 square feet and including a deli, ice cream shop and fresh produce counter by January 1, 2011. 2. To physically upgrade the store, including conversion of its cooler system to energy efficient walk-ins and replacing the existing roof by January 1, 2011. 3. Grow 2011 sales by 33.3% over 2009 sales through the aggressive marketing of the product expansions. 4. Maintain the gross profit margin on total sales at or above the 2009 gross profit margin level of 33.6% ($284,694/$846,464) through strategic and intelligent product buying and pricing. The mission of COMPANY NAME is to provide everyone residing, working, and visiting [CITY] with a thoroughly pleasant year round shopping experience by offering the best customer service, the most attractive and convenient shopping place, the best product variety, competitive prices, programs not offered by local competitors, and the strongest possible community involvement. 1. Expanding our building and food offerings so local shoppers become increasingly loyal and visitors have additional reasons to stop. 2. Remain open year round to promote the increased loyalty of local shoppers. 3. Promote customer shopping convenience by continuing such programs as WIC and Food Stamps, as well as seeking out additional similar programs. 4. Advance local tourism and community involvement by continuing to be an active and participating member of the Northern [COUNTY] Chamber of Commerce and by volunteering and fund raising for worthwhile local organizations and charities.